We express heartfelt thanks and deep gratitude to all the Brothers and Sisters who took time away from their busy schedules, and joined us in last Saturday’s Fourth Annual Fundraising Dinner Banquet. The tremendous generosity of all of you has generated approximately $100,000 in donated contributions. Inshallah, one hundred percent of these funds will be used to payoff part of the Masjid loan. Beyond the event’s financial accomplishment, what we appreciate even more is the sense of a strong supportive community, everyone exhibited. In addition to our local community members, many Brother and Sisters from allover Southern California came and strongly supported the event, and to everyone of them we are deeply appreciative. 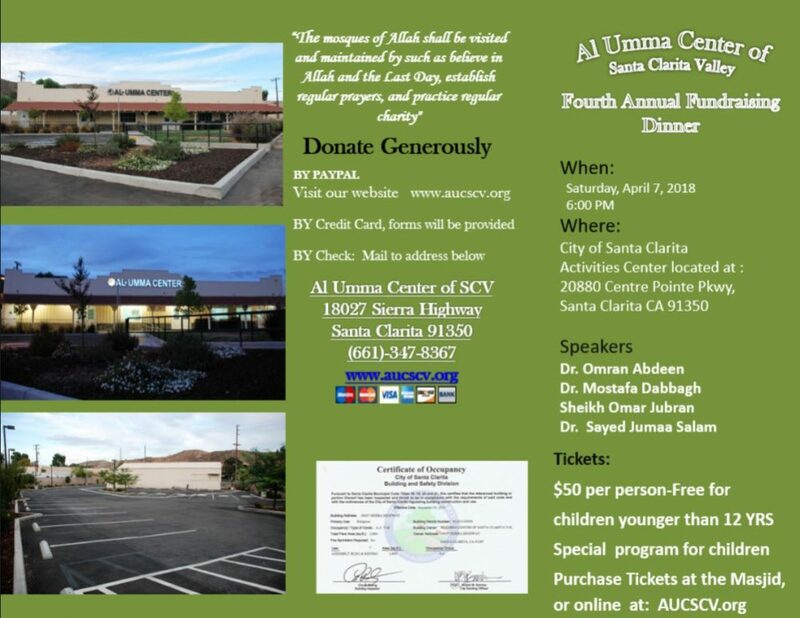 Special thanks to Dr. Omran Abdeen, Dr. Mustafa Dabbagh, Dr. Sayed Jumaa Salam, and Sheikh Omar Jubran who, as always, inspired everyone and were instrumental in shedding light on the importance of giving for the sake of Allah. We pray to Allah (SWT) to bless all of you and your families, and grant you countless Hasanat for your continued support throughout the years. Inshallah, we will continue to gain your trust and support in the future. Our Journey toward paying off the loan continues and we request everyone to keep on donating to help us deliver the Masjid debt free and, Inshallah enable it to be a place where our beautiful religion of Islam is practiced and be a magnet for all those seeking guidance to the right path.